Storytelling is a powerful art. It is also an undervalued one, as our attention spans are increasingly trained to max out at 140 characters. Storytelling is one reason I’m drawn to folk music: the murder ballads, the tales from the road (literal and metaphorical), the parables of losing your way on dusty old streets¹ and finding your way when the light cuts through the great storm in the sky.² But to craft songs about love, self-ruin, and betrayal without sounding hackneyed — that takes true talent. And Vandaveer is truly talented. Vandaveer is the D.C.-by-way-of-Kentucky alt-folk project of Mark Charles Heidinger. Mark plays with a host of other musicians including, most prominently, Rose Guerin. In the band’s stripped-down incarnation, Mark sings and plays guitar while Rose offers up crystalline harmonies that infuse haunting melodies with an angelic purity. In studio and on some tour stops, Vandaveer’s sound is fleshed out with a rotating cast that includes J. Tom Hnatow on pedal steel and banjo and Ben Sollee on cello. In trying to describe Vandaveer’s style through folk duo comparisons, I find myself thinking of Johnny Cash & June Carter but with less country and more folk, Shovels & Rope with less twang and more darkness, or maybe the Avett Brothers meets the Indigo Girls. But these rough comparisons do not capture the way Vandaveer’s music ensnares your senses with delicately intertwined harmonies that are sometimes comforting and other times aching with loneliness. Mark delivers literate rhymes with an ease that belies the angst of the narrator. Even on first listen, the melodies tug on the edges of your memory, as if you’ve heard the song before but can’t quite place it. Vandaveer’s magic is in giving musical form to the shadows of thoughts that lurk in the back alleys of our collective unconscious. I first heard Vandaveer a little over a year ago when checking out These United States, with whom Mark formerly played bass. As to why this was my first Vandaveer show, I invoke force majeure in the form of spotted owls and bridge projects (that is, work). I finally caught Vandaveer last weekend at a Stone Room Concerts house show just outside D.C. 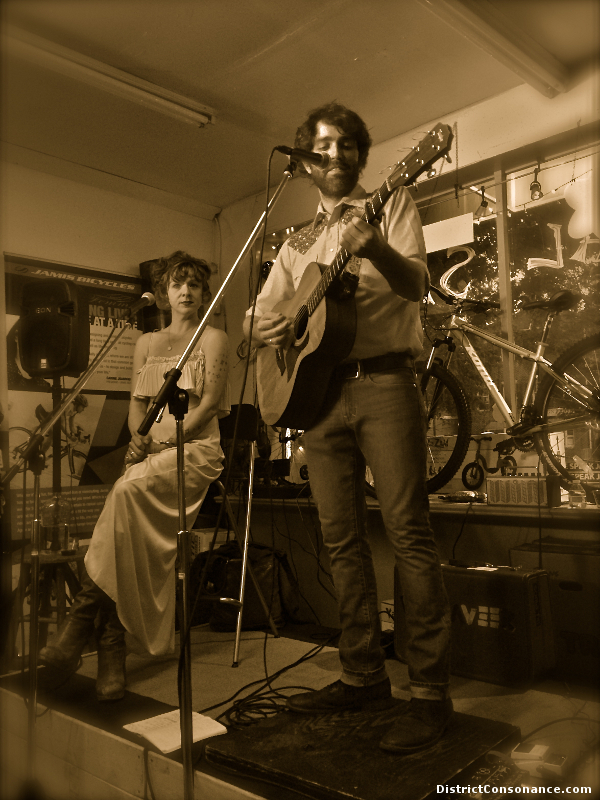 I use “house show” somewhat loosely because this particular performance was in a bike shop, Bikenetic. 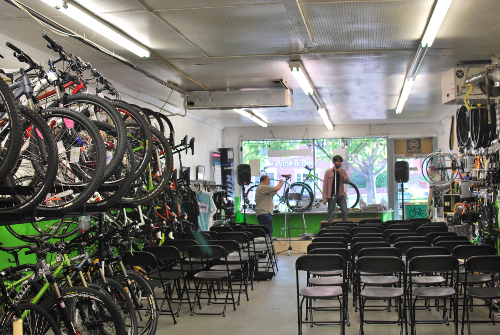 That’s right — indie folk performed in a full-service bike shop next to an Afghan restaurant. If these sound like requisite components of hipsturbia, fear not — the concert series is the perfect way (and I mean that un-ironically!) to kick back with a beer, chat with fellow music lovers, pick up the bike pannier you’ve been eyeing, and most importantly, listen to some darn good music from Stone Room’s carefully-curated lineup. 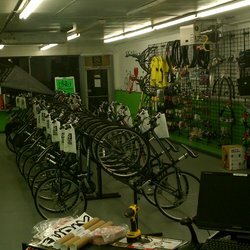 I arrived early at Bikenetic to observe (and attempt to assist with) its transformation from cycle shop to performance space. 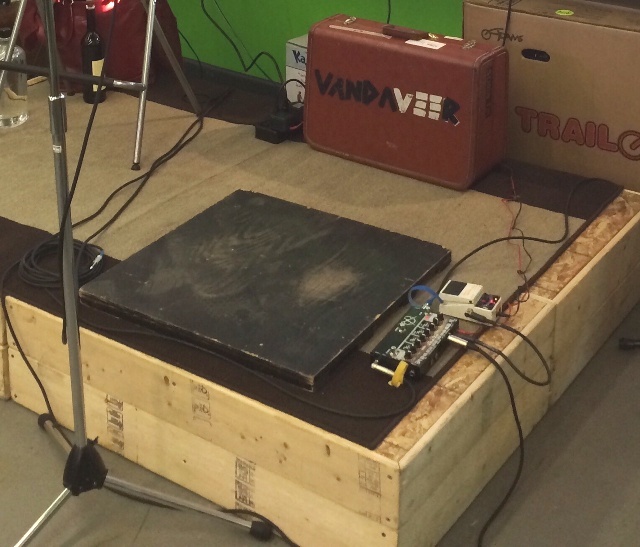 Bikes were wheeled out to make room for folding chairs and racks of gear were shifted aside to accommodate a stage, speakers, and lights. 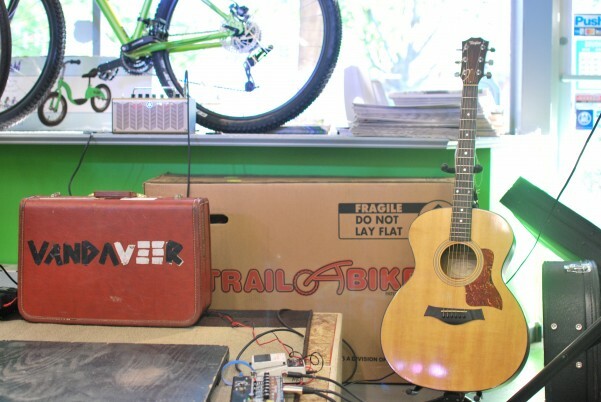 From bike shop to performance space. 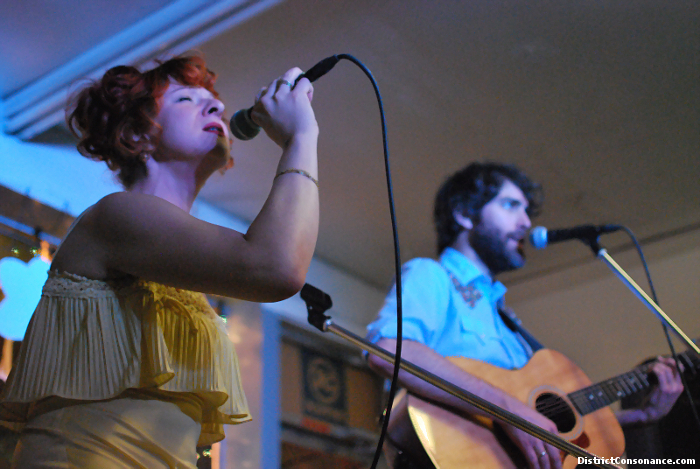 Sunday evening’s set did not include “Spite,” but Vandaveer played an array of other songs from their albums. One of my favorites is the jaunty “Nature of Our Kind,” a wry narrative from a modern-day Faust: It was half-past can’t say when, Been to Hell and back one weekend. / No, Death was a dim-witted soul, Lo! But he wasn’t grim. / Asked if we could meet again, Some other time, another place./ Oh, no, it wasn’t cheating, Just the nature of competing, I was simply twisting fate. Another favorite is the slowed-down, brooding “Turpentine,” its tight dynamic control an equipoise to the lyrical content of losing control to the darkness. Rose’s bittersweet alto provides a sturdy counterpoint to Mark’s anguished crooning, creating a controlled burn of a fiery confessional: I crossed the tracks, I crossed the line, I doused my heart with turpentine . . . Throughout the evening, Mark bantered with the audience, referring to Rose’s water container of choice while on tour — a monstrosity of a bourbon bottle — as Noah: “It’s glass. It doesn’t fit in the cup holder. It’s going to break [in the tour van]. It will be calamitous. There will be a flood. And so we call it Noah.” Mark added, “If one of you were to walk away with Noah tonight, I might just look the other way,” prompting Rose to throw him a rather convincing dirty look. The District is Vandaveer’s home base, and D.C. pride was apparent in the appreciative whoops to the opening line of “Concerning Past + Future Conquests“: Cherry blossoms dancin’ in the wind. 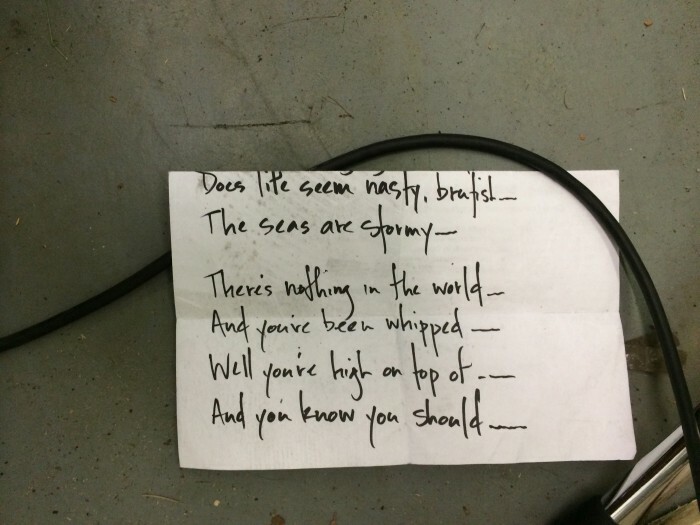 Mark prefaced the song with an explanation that he wrote a traveling tune because they’re traveling salespeople. For me, that appellation calls to mind the tragic Willy Loman, always traveling but never arriving, confusing the symbols of success for happiness. For my folk music heroes, I prefer the image of a circuit rider — a cleric spreading the gospel from town to town, where every stop is a temporary home. This is a romanticized image, but perhaps it is not completely off base — Mark is the son of a minister. Mark did not take the cloth, but in his own way, through Vandaveer, he has become a peripatetic preacher, offering parables through poignant songs. After all, not all who wander are lost, and in the tweetable, Instagrammable, glorious cacophony of (post)modernity, where all that is solid melts into air, we discover new kinships and maintain ties one story, one song at a time. So please keep making music, Vandaveer. We will gladly come along for the journey. Lyrics to “Come On Up to the House” — a gospel song popularized by Tom Waits. Update: Click here for photos from Vandaveer’s August 2014 set at the 9:30 Club, and here for my interview with pedal steel and dobro player Tom Hnatow. 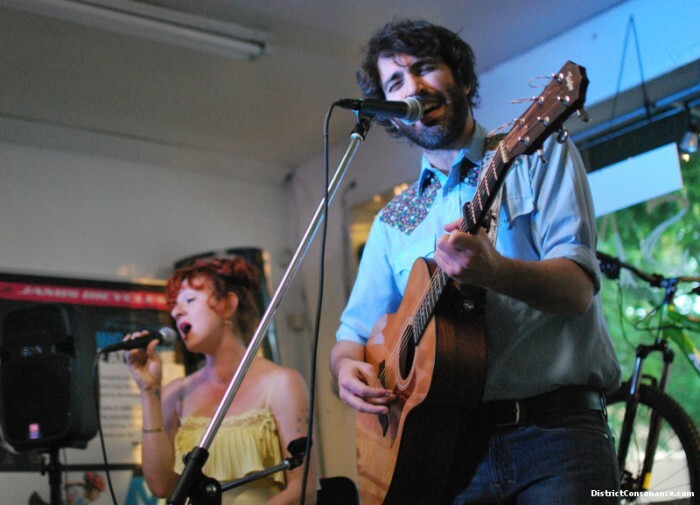 Check out Vandaveer’s schedule and pick up their albums here. And if you live in the D.C. area, sign up for Stone Room’s mailing list, too. ¹ I’m not a fan of footnotes (vs. in-line text), but here, I wanted to be subtle about referring to song lyrics. The phrase is in “Concerning Past + Future Conquests,” from the 2010 album, Dig Down Deep: Stumblin’ down avenues and dusty old streets / I wanna walk ’em all, I’m gonna walk ’em all. ² And this is from “The Nature of Our Kind”: A thousand points of light cut through the great storm in the sky, Sunbeams somersaulting down at twice the speed of light / With hands crisscrossed, all the clocks on the walls told different times, And the cheap red wine splayed all the tiny fragments in my mind. I see you’re swooning over the adroit use of alliteration and clever turns of phrase. It’s a perfectly normal reaction. And there’s a support group for that. It’s called Vandaveer’s Mailing List. (Scroll to the bottom of the home page to register). It’s always too long between District Consonance posts but outstanding writing like this reminds us that it’s worth the wait! Thanks for the knowledge about the Stone Room concert series. Clearly I should get out more. Have you been to Bathtub Republic? I had not heard about it until Bob Boilen mentioned it the other day. I somehow neglected to respond to this. Thanks, L — I appreciate the kind words. I always want to see more house shows and will have to check out what Bathtub Republic has coming up. Aw, thank you! These comments keep me going. 🙂 Your blog is lovely, by the way.